Having separated geographically from Schuyler County in 1839, Mt. Sterling became the seat of government for the County of Brown. However, the village was not officially organized until 1854 with the Courthouse being constructed in 1868. Mt. Sterling, located geographically in the center of the county, quickly became the hub of economic and civic activity during the 19th and 20th centuries. The advent of the railroad era fostered the town’s prominence in the county. The Wabash Depot and freight house, also built in 1868, quickly became a focal point of activity and interest for the citizens of the County. Upon stepping on the depot platform, one cannot help but think of the people who arrived and departed through the doors of the vintage depot. If one is imaginative, he or she can hear the approach of the train and mentally watch those who arrive or depart. The old depot observed thousands of joyous and sad arrivals and departures. It witnessed boys leaving for war; it absorbed the sorrow of those families returning for funerals or perhaps those who left, never to return, but it also witnessed joyous homecomings. There were two passenger trains each way every day and one freight train each way. Children and other folks crowded around as the circus train arrived; onlookers came to see entertainers on their way to the Opera House. Coal and lumber arrived to fuel the homes and business and to build new structures. Merchants were much relieved when their latest delivery of goods from the east coast arrived and could be transported to the busy uptown area. Today that old depot, carefully restored by the Brown County Historical Society, sits on the Fairgrounds and houses artifacts that tell the story of Mt. Sterling and its environs. 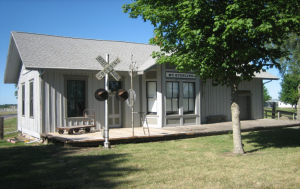 It is known as the Whistle Stop Depot Museum. 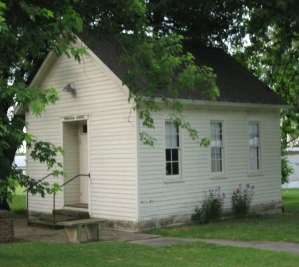 Nearby is the restored one room school, Ferguson, which displays artifacts from country schools. The Fairgrounds, upon which these buildings are housed, had its origins in 1872 when a group of enterprising men bought a patch timber on the northeast corner of the city and organized an agricultural society. Thus began, what is today, the longest continuously running county Fair in the State of Illinois. Main Street in Mt. Sterling was not unlike the Main Street that Sinclair Lewis dubbed “the climax of civilization”. Initially many of the structures along Main Street were made of wood, only to be replaced by fine brick structures, many of which are still standing today in the historic district. Envision the street as it was 100 years ago when the sidewalks were bustling with activity and shoppers were tempted by the ever changing window displays in the department stores. As one strolled along Main Street, there were not only department stores, but groceries, meat markets, bakeries, barber shops with their prominent barber poles of red and white stripes, milliners, tailor shops, jewelry stores, dairy bars, candy kitchens, photographers and shoe stores. There were also harness and wagon shops, blacksmiths, hardware stores and furniture stores in the old historic district. Several of the business served the county for more than a century. Among some of the most noteworthy merchants were names like Crane, Givens, Croxton, Briggs, Taylor, Brockman and O’Neil. The stores along Main Street served the entire county; patrons came to town by horse and buggy or perhaps on the train from Versailles or Timewell. The department stores delighted the entire family with a vast array of merchandise. At the beginning of each shopping season, the stores supplied the local papers with flowery copy to lure shoppers into their stores; each store window held handsome and enticing displays. Children lingered at the toy and book counters while their parents shopped for everything from china to wallpaper. Goods from one-cent pencils to pianos and bicycles were offered. The new fashions each spring and fall brought throngs of shoppers to Main Street in Mt. Sterling. Two of the larger stores, Cranes and The Big Chicago Store, furnished entertainment all day during their spring and fall openings. Merchants went east twice a year to buy the latest fashions and quality goods. There was no need to travel out of the county to shop, although occasionally ladies took the train to Quincy for a shopping excursion. Shopping patterns were different seventy-five to one hundred years ago. Stores stayed open late, very late on Saturdays. Almost all merchants were open until 9 or 10 p.m. When shopping for groceries, a list was made and given to the grocer. The customer then moved on to another store for more shopping. The grocer’s boy got the order together, and if not called for before closing, the order was placed on the sidewalk with the family’s name affixed. Perhaps dad went to the baths for a hot water soak, a proper shave and haircut while the rest of the family shopped. The streets were crowded and everyone socialized. The Opera House on North Capitol was the cultural center of the county seat. Built around 1890 and destroyed by fire on Christmas Eve, 1976, the building hosted dances, fancy dinners, Chautauqua speakers, traveling light opera companies, commencements, Lodge meetings, and the first movies shown in the county. Storefronts were on the ground level, the theater and stage area above. An older structure, Murphy’s Opera House was on the southeast corner of Main St. and Capitol Ave. Again a theater area above, and a large department store operated by the Manny Brothers on the street level; the site is a war memorial today. The pride of Main Street was the First National Bank opposite Murphy’s Opera House, and across Main Street from The Big Chicago Store, another large department store. The Bank was owned by the Crane family. The first generation was headed by Elias F. Crane who came to Mt. Sterling from New York in 1846. He became the premier merchant of the County, and having connection to East Coast funds, became a money lender. In 1878 he chartered the bank. Its first location was on North Capitol in a building still standing. In 1908 the Crane family flexed its financial muscle and built the fine bank structure on the corner. It was designed to project a certain solidness, which promoted faith in the financial stability and wellbeing of Brown County. Offices for professional people were above the bank. This seemingly unshakable institution foundered in 1930, in the storm of the great depression. For many years thereafter, Leonard and Wilma Gross operated a fine jewelry store from the premises. Immediately south of the bank were the offices of the Mt. Sterling Telephone Company. Just west of the bank is one of the oldest buildings on Main Street; it has graceful arched windows above the store fronts, and had an arched fanlight above the doorway to the second floor apartments. Across Main Street to the north was the Big Chicago Store. This store was founded by Willis Taylor who had merchandised dry goods for years before moving into this location in 1897. The name, we suppose, was meant to conjure an image of the big important city of Chicago. Taylor’s son, Harry, operated the establishment for many more years, followed by his own son, True Taylor. The store closed about 1946, a year short of a 50 year run. The store shipped laundry, shirts and collars to Quincy. Men could pick up the returned clothing items on Sunday morning, which then was a provident time to shop for suits and menswear. Part of the interior structure of the Big Chicago Store was added to “The Penny Store” (not to be mistaken for J. C. Penny) founded by Charles Briggs, and the entire structure operated by Richard Gordley from 1946 until sometime in the 1990’s.